is the natural sugar found in milk. Libera, Mozzarella, Mozzarella for Pizza, Scamorza, Butter, all without lactose. “Libera” lactose-free cheeses are ideal for lactose intolerants who don’t want to miss their favourite foods. Our range of products include lactose-free mozzarella for pizza, lasagne, caprese, scamorza, butter. Lactose intolerance is caused by a deficiency of the enzyme lactase, which is produced by the cells lining the small intestine. Lactase breaks down lactose into two simpler forms of sugar called glucose and galactose, which are then absorbed into the bloodstream. Lactase deficiency begins after about age 2 . Most children who have lactase deficiency do not experience symptoms of lactose intolerance until the age of 6. Common symptoms of lactose intolerance are abdominal cramps, gas, diarrhea. Symptoms normally occur within 2 hours after consuming dairy, depending on the level of intolerance. 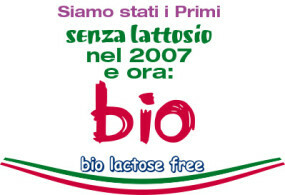 “Libera” products allow lactose intolerant people to enjoy calcium rich food. Symptoms normally occur within 2 hours after consuming dairy, depending on the level of intolerance. Lactose intolerance is most common among Asians, affecting more than 90 % of adults in some communities. People with ancestry from Northern Europe, on the other hand, have a 5% rate of lactose intolerance. In addition to variability in the prevalence of lactase deficiency, there also is variability in the age at which symptoms of lactose intolerance appear. If you are lactose intolerant you will experience these symptoms after eating diary products. If you are not sure you can always do a quick test in the hospital. Ten years ago we created our brand Libera, with the first lactose free mozzarella on italian market, adding every year more products, such as burrata, scamorza, buffalo mozzarella, goat cheese. Our dedicated attention towards consumer’s needs led us to bet once more on quality, creating the first organic lactose free line in Italy. Cow’s milk mozzarella, burrata and stracciatella, made exclusively with the best certified milk from our breeding farms in Apulia, in the south of Italy. Our cattle are fed with cereals and fodder, without any O.G.M. or artificial food, with free access to pasture and a balanced space between number of animals and available area. The milk produced is analysed daily in certified external laboratories. In case of veterinary intervention the animals are treated exclusively with homeopathic or herbal medicine. Environmental sustainability, accurate supervision of raw materials and animal wellness are the key points of our « Bio » philosophy. If you are lactose intolerant or if you are looking for a high quality cheese, healthy and organic, you will enjoy our « Libera Bio » line.